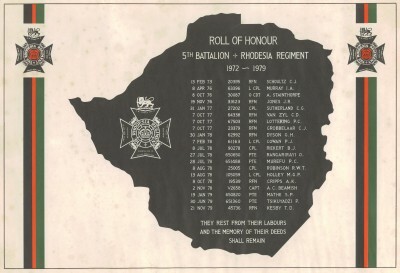 5th Battalion Rhodesia Regiment Roll of Honour provided by Buck Jones. The black granite Roll of Honour itself (weighs 130kg) was shifted out of Zimbabwe in late 2014 by the Rhodesian Services Assn with appreciated assistance from people on the ground. It is now in the Memorial Garden of The Lion & Tusk Museum.